The second Thomas Jefferson (SSBN-618) was laid down on 3 February 1961 at Newport News, Va., by the Newport News Shipbuilding & Drydock Co.; sponsored by Mrs. Robert S. McNamara; and commissioned on 4 January 1963, Comdr. Leon H. Rathbun (Blue Crew) and Comdr. Charles Priest, Jr., (Gold Crew) in command. After shakedown training by both crews and a yard availability period, the fleet ballistic missile submarine was assigned to Submarine Squadron (SubRon) 14 in early October. On 28 October, the Blue Crew took the submarine on her first deterrent patrol which ended at Holy Loch, Scotland, in December 1963. Thomas Jefferson continued patrols from Holy Loch for the next four years and also acted as flagship for SubRon 14. In 1966, she returned to New London for two training and rehabilitation periods. She began her 15th deterrent patrol on 12 January 1967 and, upon its completion, returned to Newport News for her first overhaul and refueling. On 17 June 1968, the submarine was ready for sea, and refresher training was held for both crews. Her 16th patrol began on 29 October and terminated at Rota, Spain, on 5 December 1968. Thomas Jefferson made four deterrent patrols in each of the following years: 1969, 1970, 1971, and 1972. She also conducted special operations in 1970 and 1971. On 20 October 1972, the Gold Crew was awarded a Meritorious Unit Citation for its special operations of the previous year. Thomas Jefferson completed two patrols in 1973 before returning' to the United States to hold midshipman training from 18 June to 31 August. Her last patrol of the year terminated on 12 December 1973. Her 36th, and final, patrol in the Atlantic lasted from 31 January to 22 March 1974. After calling at Norfolk and Charleston, the submarine returned to New London on 22 May. Thomas Jefferson was then reassigned to the Pacific Fleet with her new homeport at Vallejo, Calif. She stood out of New London on 7 June en route to the west coast and arrived at Mare Island on the 27th. On 1 July 1974, Thomas Jefferson entered the Mare Island Naval Shipyard for overhaul, refueling, and conversion to the Polaris A-3 missile system. She remained in the yard until 17 November 1975 when she got underway for Bremerton, Wash. The submarine remained in Puget Sound for a month and then moved to San Diego. During the period January to March 1976, Thomas Jefferson's Blue Crew conducted post-overhaul shakedown operations and then transited the Panama Canal to conduct a Polaris missile firing at Cape Canaveral, Florida. The Gold Crew took over the ship on 4 April and conducted additional post-overhaul shakedown operations which included a missile firing at Cape Canaveral, a transit of the Panama Canal, and a missile loadout at Bangor, Washington, before resuming deterrent patrol operations with the Pacific Fleet on 8 August. 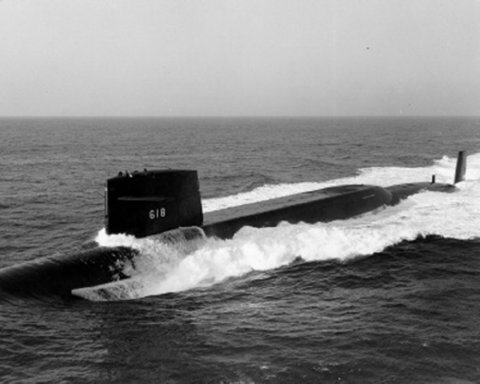 Thomas Jefferson continued these operations as a unit of Submarine Squadron 15 throughout 1977 and 1978, at the end of which she completed her 44th deterrent patrol.